I knew that it would be an interesting challenge to stick to a no sugar diet, especially with three kids in the house gleefully eating the stuff in front of me. 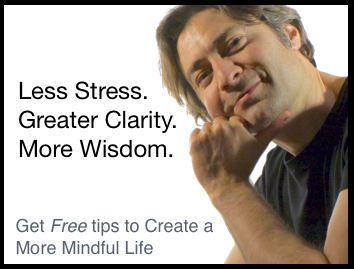 I also knew that mindfulness would be my secret ally. This video is part one of a series where I show you how I used mindfulness to stay sugar free for the last 4 months, with way less fuss and deprivation than I had imagined, and how you can do the same. The first step is to be able to accurately and consistently identify the physical sensations, thoughts and other mental activity that tell you that you want to eat something sweet. If you’re not sure what these sensations and thoughts feel like, just watch the video: I’ll show you a really easy way for you to figure this out for yourself. Your task is get familiar enough with these sensations that you can easily identify them when they arise. If you have a friend who’s trying to quit sugar, or struggling with food cravings, send them an email with the link to this post. It could really help them out. About 4 months ago, I decided to stop eating sugar. No more of my favourite chocolate. No more sugar in my coffee, or honey in my tea. No more cookies, cakes, or desserts. Aieee! I knew that it would be an interesting challenge to stick to that decision, especially with three kids in the house gleefully eating the stuff in front of me. I also knew that mindfulness would be my secret ally. This video is all about how I used mindfulness to stay sugar free for the last 4 months, with way less fuss and deprivation than I had imagined, and how you can do the same. 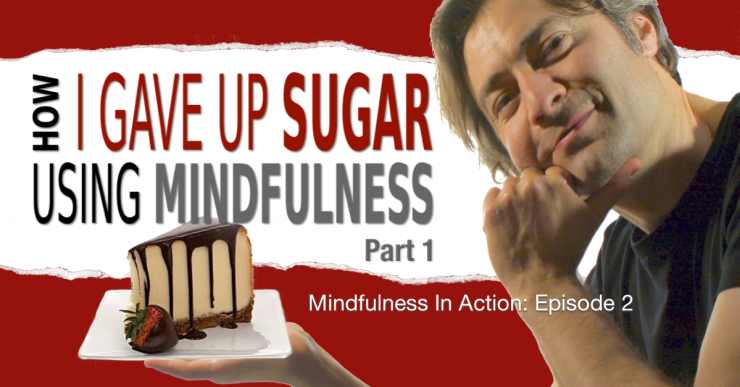 When you make a change in your habits, such as not eating sugar in my case, the first step in applying mindfulness is the identification of a desire to do things the old way. I needed to be able to accurately and consistently identify the physical sensations, thoughts and other mental activity that indicated that I wanted to eat something with sugar in it. If you’re not sure what these sensations and thoughts feel like, you can easily find out by taking something you used to eat and enjoy that has sugar in it, in my case that would be my favourite chocolate, and put it in front of you. Now observe the physical sensations that arise as you look at the food. For example, I notice that saliva begins to collect in my mouth, and there’s a subtle tensing in my abdominal area. There’s also an urge to take a piece and put it in my mouth. It feels like a kind of restlessness that I need to act on in order to make it go away. and other forms of justification for eating some chocolate. There’s also another kind of mental activity which is really interesting. I can see a mental movie of myself picking up a piece of chocolate, putting it in my mouth and eating it. While I’m mentally chewing the chocolate, I can almost feel the sensations of it in my teeth and on my tongue and what it would taste like. Very cool stuff! It’s interesting, because most people believe that they make rational decisions. They weigh the pros and cons of an action and then act accordingly. But if you have a close look, you’ll realize that most of the time, just like here with the chocolate, your decisions are largely governed by habitual reactions to seek pleasure and avoid the unpleasant. In my case here, I’m clearly experiencing desire for the chocolate in front of me. That desire is based on previous conditioning – the craving for something I perceive as pleasant. My thoughts, which seem so rational, are simply justifying acting on that underlying craving. And that’s the case for most of the decisions we make on a day to day basis. It’s just that we often don’t notice what’s actually going on under the hood. Ok, so now that you’ve identified the physical sensations and mental activity that arise when you get a hankering for some sweet stuff, your task is get familiar enough with these sensations that you can easily identify them when they arise. So, go ahead and practice with your sugar of choice so you experience what I’m talking about. Just be mindful so that you don’t end up eating it! In part 2, I’ll show you what to do once you notice the physical sensations, thoughts and other mental activity that tells you you want to eat something sweet. I’m Nick Grabovac. Thanks for watching and see you next time.